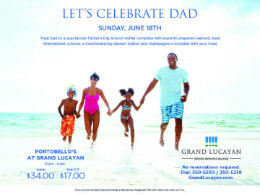 Freeport, Grand Bahama - Let's celebrate Dad Sunday, June 18th. This Easter enjoy a slice of Culinary Heaven. 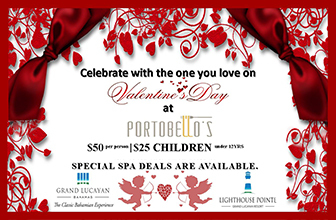 Join Grand Lucayan for lavish Holiday Feasts at Portobello's. We'll do the cooking. You do the celebrating. 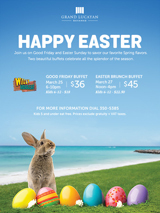 Come in for special buffet menus o Good Friday and Easter Sunday. 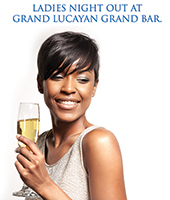 Freeport, Grand Bahama Island - Come on out to the Grand Lucayan Bar and enjoy our Ladies Night out Happy Hour from 6pm - 10 pm Thursdays to Saturdays . Sip specially priced cocktails, then enjoy a delicious dinner at Churchill's or stroll over to Portobello's for dinner al fresco with friends! GYM - Star Trac treadmills, bicycles and steppers team up with Flex weight training equipment to keep your fitness routine fresh and focused. YOGA - Whether you’re a beginner or longtime yoga enthusiast, we think you’ll agree that nothing beats striking a pose against our beachfront backdrop. Organizers for the upcoming Faith Fest to Grand Bahama Island, taking place March 23-25, 2017 reported that rooms at the Grand Lucayan Resort is already completely sold out and they are indeed happy with the high interest level shown in the event. More than 300 visitors from around the world have been booked for the cultural immersion and spiritual rejuvenation event. Freeport, Grand Bahama Island - Every Friday starting as of February 3rd, 2017 for Jazz with Clazz at Churchill’s Grand Bar for our High Heel, Lipstick & Bow-tie Happy Hour from 6pm. Specials will be on flavoured Martinis, 2 for 1 on selected Cocktails & more. Grand Lucayan Resort in Grand Bahama Island, The Bahamas issued the following statement after Hurricane Matthew devastated the island on Thursday. Hurricane Matthew Update: Out of an abundance of caution, Grand Lucayan successfully evacuated all guests and employees prior to the storm making landfall. At this time, we will remain closed until we're able to finish a complete assessment of the property. We appreciate everyone’s kind words of support and encouragement. 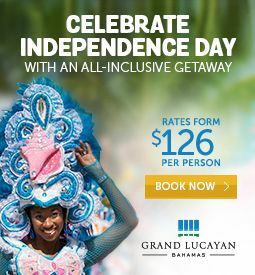 Freeport, Bahamas - Celebrate Independence Day with an All-inclusive Getaway at The Grand Lucayan. Rates from $126 per person. The Regenera Global conference is coming to Freeport and will take place at the Grand Lucayan Resort from June 23-25, 2016. Grand Bahama based cell therapy facility, Okyanos has announced they are platinum sponsors of the event and will be hosting a Cell Therapy Surgical Center Tour and Networking Reception event as part of the conference agenda. 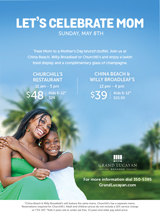 Freeport, Grand Bahama Island - Let's celebrate Mom Sunday, May 8th at The Grand Lucayan! Treat Mom to a Mother's Day brunch buffet. Join us at China Beach, Willy Broadleaf or Churchill's and enjoy a lavish food display and a complimentary glass of champagne. 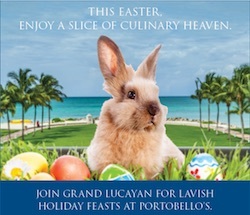 Freeport, Grand Bahama - Happy Easter from The Grand Lucayan Bahamas! Join us on Good Friday and Easter Sunday to savor our favorite Spring flavors. Two beautiful buffets celebrate all the splendor of the season. 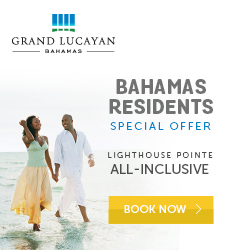 Freeport, Grand Bahama Island - Grand Lucayan presents a Bahamas residents special offer at Lighthouse Pointe where island authenticity of the Bahamas meets the ease and affordability of an all-inclusive resort. Guests enjoy spacious, stylishly appointed guest rooms and exclusive access to four new restaurants, as well as all recreation, entertainment, meals and premium-brand beverages, gratuities, taxes, service charges and more. 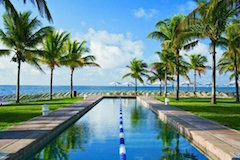 Freeport, Grand Bahama Island - Grand Lucayan is offering unbelievable Bahamas residents rates starting at just $89 per night (if booked by Dec. 20, 2015. Promo Code BAHAMAS). 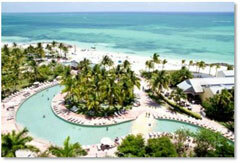 Grand Lucayan knows that local residents enjoy island life every day, but need a relaxing escape! 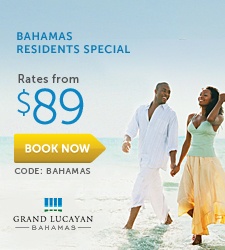 The rate for Bahamas local residents start at $89. 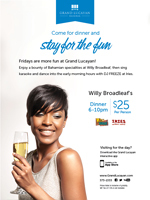 Freeport, Grand Bahama - Don't miss Grand Lucayan Bahamas 10th of July Bahamas Independence Day Buffet at Willy Broadleaf featuring Live Entertainment 6pm - 10pm. Children under 5 years of age eat FREE! Enjoy a bounty of Bahamian specialities at Willy Broadleaf, then sing karaoke and dance into the early morning hours with DJ FREEZE at lries. GRAND BAHAMA ISLAND, Bahamas – Think spring and what likely comes to mind are new growth, fragrant blooms, refreshing breezes and cleansing showers. 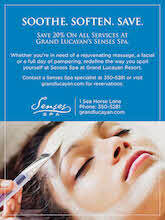 Grand Lucayan, Bahamas invites spa-goers to take a page from Mother Nature’s spring to-do list and indulge in a rejuvenating experience of their own at Senses Spa, where renewal is delivered with an island twist. And with the Bahamas rainy season still several months away, the only showers spring spa-goers will likely encounter are of the Vichy variety.